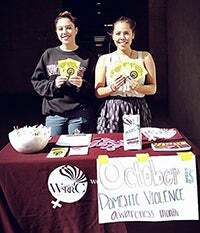 The Women's Research and Resource Center, supported by the College of Humanities and Associated Students, serves as a place where students on campus and in the community can find resources and services. The Center is directed by Prof. Shira Brown, a CSUN alumnus and lecturer in the Gender and Women's Studies Department. The Center has a Student Director, usually from the Gender and Women's Studies Department. There are currently two student directors, DoMonique Osborn and Pam Palencia. The Department of Gender & Women’s Studies and the Women’s Research and Resource Center are deeply concerned with the effect that the executive orders of the Trump administration will have on our students, faculty, and staff and the rest of the country. President Trump has taken the first steps to repeal the Affordable Care Act that can leave 20 million of us without health coverage and has promised to defund Planned Parenthood; reintroduced the Global Gag Rule that restricts US funding to NGOs that provide abortion education and procedures risking the lives of millions of women in the global South; he reauthorized the Keystone XL Pipeline and the Dakota Access Pipeline construction violating the sanctity of Native lands and endangered the water sources for future generations; he has ordered the building of a wall along the Mexican border that will cost billions of dollars; while empowering law enforcement to act as immigration officers and expanding significantly the number of border patrols; he also has the intention of prohibiting federal funding to sanctuary cities like Los Angeles. His most recent 90-day ban on travelers and refugees entering the United States from seven Muslim countries (Libya, Iraq, Iran, Somalia, Sudan, Syria, and Yemen), even those with a visa or a permanent residence status is not only unconstitutional, but also reminiscent of some of the darkest periods of US and European history. We want to reassure our students that the Department of Gender & Women’s Studies and the Women’s Research and Resource Center will continue with its mission to achieve social justice for all, fight white supremacist policies, deepen our democracy, and create world peace. We will continue with our efforts of helping our students to become compassionate and critical thinkers. More than ever we need to elevate our historical and moral consciousness and work together for a better world. Another US is possible.